ITC Systems, RICOH and the Charlotte Mecklenburg Public Library: Pay for Copies and Prints using Coins, Bills & Credit/Debit Cards! St Louis MO – 16th of May, 2016 — Strong partnerships and a vigorous focus on customer service have enabled ITC Systems to develop an innovative Payment Solution for copies and prints at the Charlotte Mecklenburg Public Library with RICOH, says ITC Systems’ VP Sales John Wilmot. 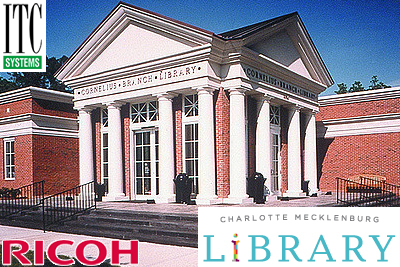 The Charlotte Mecklenburg Public Library system is a technologically focused organization with twenty branches located in Mecklenburg County with the Main Library located in Charlotte. The advent of using the Credit & Debit cards as well as Mobile technologies has aided in the patron’s overall appeal to the solution. This solution makes the choices for payment on these services easy and therefore increases the library patron’s satisfaction overall. RICOH’s sales and tech team worked well with ITC Systems in getting the POC together and with the library in helping them understand more about the technology. When partners like ITC Systems and Ricoh work together the end customer happy in that they only have one call to make and they will receive the service they need no matter what. About: ITC Systems is an international company specializing in cashless Integrated Transaction Control Systems. The firm designs, develops and implements state-of-the-art cash card management systems on university campuses and in public libraries, government departments, food service environments and other closed institutional settings. With offices in Toronto and St. Louis, and an extensive network of distributors, dealers, agents and service contractors, the organization offers the most flexible and comprehensive online and offline card systems on the market today. About: Charlotte Mecklenburg Library began more than a century ago as a treasured repository of knowledge. Although people have evolved to read, explore and acquire knowledge in many new ways since then, one important feature has endured: Our services remain free to all who come to us with a desire to research, learn and experience. We serve hundreds of thousands of people while also responding to the needs of individual library visitors. Since our founding in 1903, our role as a provider of lifelong education in this community has never been more relevant. About: The Ricoh Group has consistently provided innovative products and services since its inception in 1936. All of our employees have drawn on The RICOH Way and its founding principle, the Spirit of Three Loves, so we can continue to grow as a trusted and valuable corporate citizen for our customers and society at large. We accordingly engage in environmental management, which is about pursuing profits without compromising our precious planet, thus contributing to social sustainability worldwide.